These Interstate highways are signed consistently with reassurance markers and referenced on guide signs from intersecting routes. The following guides cover every signed main/2-digit and branch/3-digit route within the Eisenhower Interstate System. 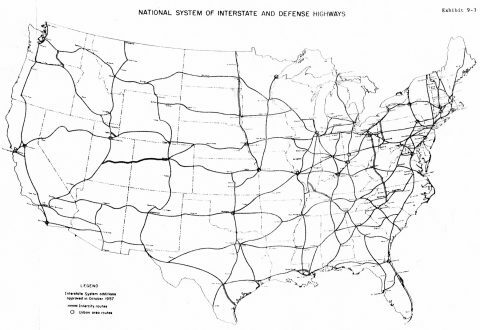 The main cusp of the Interstate system, there are two main groups of two-digits, the I-X0’s and I-X5’s, which represent the main national based routes, and Interstates that do not end in 0 or 5, many of which represent newer additions to the system or regional based routes. Even numbers run east-west and are numbered upwards from I-2 in the Rio Grande Valley to I-96 across Michigan (I-90 and I-94 run further north latitudinally however). Odd numbers run north-south, starting with I-5 along the West Coast and increasing numerically to I-95 along the Eastern Seaboard. The additions of I-97 (east of I-95 in Maryland, but not the furthest east overall) and I-99 (added by legislation and situated between the corridors of Interstates 79 and 81), were added later and do not fit within the grid. Three-digit Interstates can generally be classified in one of two categories: loops and spurs. However more recent additions to the system grant some 3di’s status as their own through route. Even numbered Interstates were meant to be loops or simply to connect two other Interstates. Odd numbered Interstates were reserved for spurs, or a route that ends with a non-Interstate highway. As originally envisioned, 3di-loops were to serve as bypass routes for cities, beltways or urban routes serving downtown areas. Beltways were built initially as through-route bypasses, but now mostly act to join the suburbs with the city center and otherwise serve as commuter routes. Beltway examples include Interstate 275 around Cincinnati, Ohio and Interstate 495 around Washington, DC. Urban loops include Interstate 675 through Saginaw, Michigan and Interstate 235 through Des Moines, Iowa. Bypass routes include Interstate 495 around Wilmington, Delaware and Interstate 205 around Portland, Oregon. Another exception to the even-numbered rule is Interstate 476, which was lengthened in 1996 from an outer bypass/commuter route west of Philadelphia into a long distance route joining Southeastern Pennsylvania with Scranton and the Poconos Region along the Northeast Extension of the Pennsylvania Turnpike. Three-digit Interstates fitting the category of spurs were to connect a city with a parent Interstate route, or to serve as a more direct route to an area in lieu of the main two-digit routes. Expansion of the Interstate system resulted in some exceptions to these basic rules, with extensions of Interstate 376 northward from Pittsburgh, Pennsylvania and Interstate 520 east to North Augusta, South Carolina extending former spurs into full loops. Traditional spurs include Interstate 540 southwest to Fort Smith, Arkansas and Interstate 182 east to the Tri-Cities of Washington. Odd numbered 3-digit Interstates that function as a more direct route to the main 2-digit Interstates include Interstate 380 northwest from I-80 to I-84 in northeastern Pennsylvania and Interstate 135 north from Wichita to Salinas in Kansas. Both of those routes were originally given a suffixed designation however. 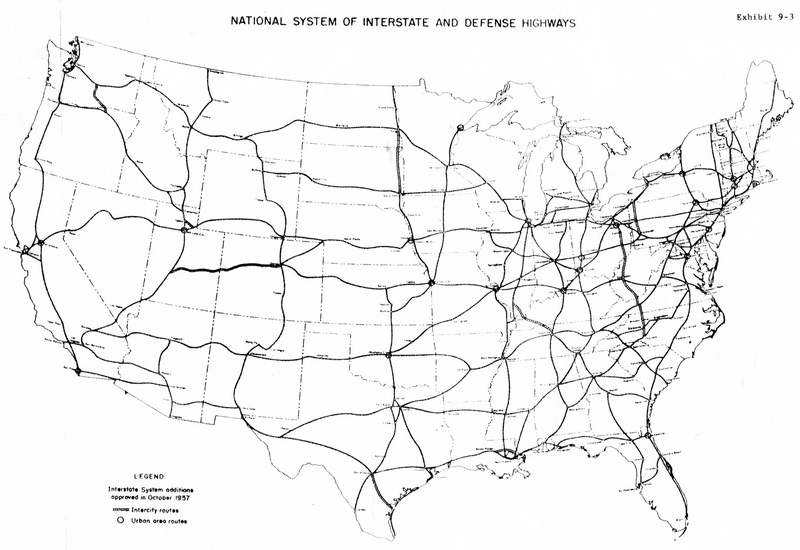 Suffixed Interstate routes, Interstates ending with the letter E, N, S or W, expanded the function of a primary route as a cardinal-direction based branch. This allowed both Baltimore and Washington to both be served by Interstate 70 and Philadelphia to lie along the Interstate 80 corridor via Interstate 80S. AASHTO however determined in 1973 that suffixed based Interstates were to be renumbered to eliminate their use due to motorist confusion. All were changed by 1980 with the exception of the Interstate 35E/W separation through both Dallas-Fort Worth and Minneapolis-St. Paul, because neither city wanted to relinquish the parent route in lieu of a three-digit renumbering. The act of Congress to designate the Interstate 69 corridor from the Lower Rio Grande Valley (LRGV) in South Texas northward to the preexisting Interstate 69 in Indianapolis included a provision for three new suffixed routes. They are Interstate 69W, serving Laredo, Texas to the west, Interstate 69C (C for Central Branch) serving the LRGV at McAllen to the south and Interstate 69E, running south to Corpus Christi and Brownsville near the Gulf of Mexico. Because these routes were written into law, they are exempt from the long standing AASHTO rule regarding suffixed routes. 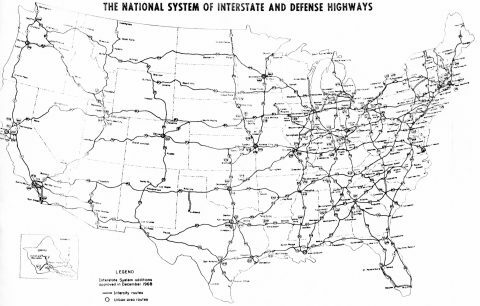 Interstate System additions approved in October 1957. A number of urban routes were added to the system nationwide as well. 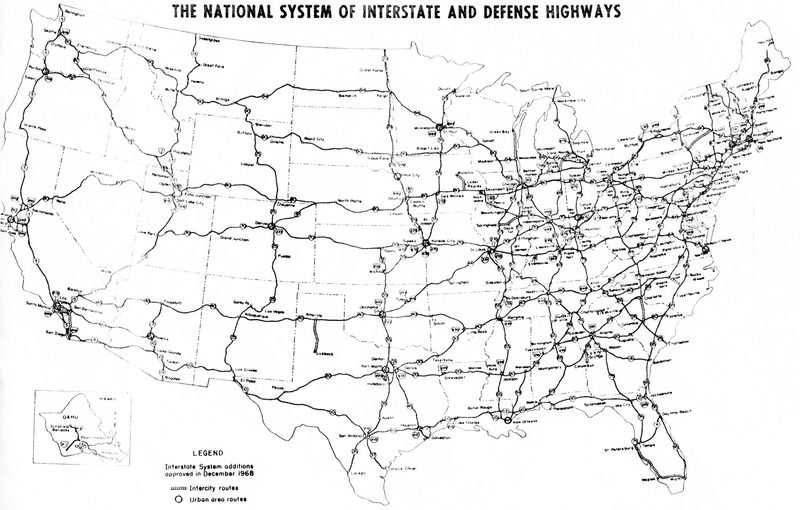 Interstate System additions approved in December 1968. Lengthening Interstate 75 from St. Petersburg to Miami, Florida. Again a number of urban area routes were added system wide across the country.